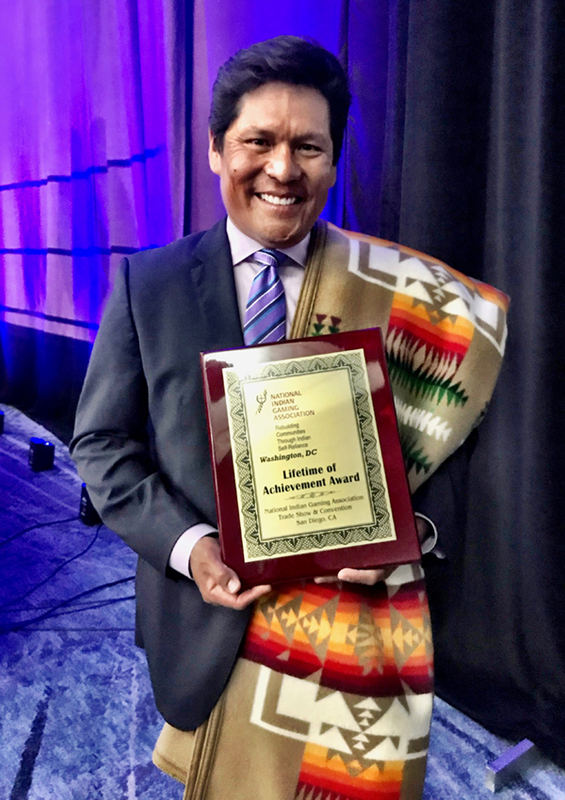 San Diego, CA – April 02, 2019 – The National Indian Gaming Association (NIGA) held its annual Chairman’s Leadership luncheon last week honoring Professional Golfers Association Golfer and Sports Commentator Notah Begay III with the coveted Chairman’s Lifetime Achievement Award at the 2019 Indian Gaming Tradeshow and Convention in San Diego, California. Notah Begay III, from the Navajo Nation and San Felipe/Isleta Pueblos, is the only full-blooded Native American to have played on the PGA TOUR, was born and raised in Albuquerque, New Mexico. Notah secured a scholarship to Stanford University where he earned a degree in Economics in addition to earning All- American Honors three times and leading the golf team to a National Championship in 1994. When Begay is not on the golf course, he dedicates his time to positively impacting the Native American community. In 2005, Notah launched The Notah Begay III (NB3) Foundation. The Foundation works to battle obesity and diabetes in Native American youth. In addition, Mr. Begay owns a golf course development firm and works exclusively with Native communities to develop world-class golf properties. Begay was named one of Golf Magazine’s Innovators of the Year in 2009 for his philanthropic work through the NB3 Foundation and has also been named one of the Top 100 Sports Educators in the world by the Institute for International Sport. In 2012, he received the Charlie Bartlett Award from the Golf Writers Association of America for his contributions to philanthropy and his community through the NB3 Foundation. In August 2012, the Robert Wood Johnson Foundation honored Mr. Begay and the NB3 Foundation with the Steve Patterson Award for excellence in Sports Philanthropy. He is a golf commentator for NBC Sports and the Golf Channel and Begay is also Founder and Chief Executive Officer of KivaSun Foods. Notah Begay, III joins other past distinguished recipients such as actor and director, Wes Studi, Tricia Wood, a Native American Casting Director, Lynn Valbuena, Chairwoman of the San Manuel Band of Mission Indians, LaDonna Harris, Founder and President of Americans for Indian Opportunity, Steve Ortiz, Chairman of the Prairie Band Potawatomi Nation and Stanley Jones, Sr. former Councilman of the Tulalip Tribes, to name a few.